Inspired by The Rev. 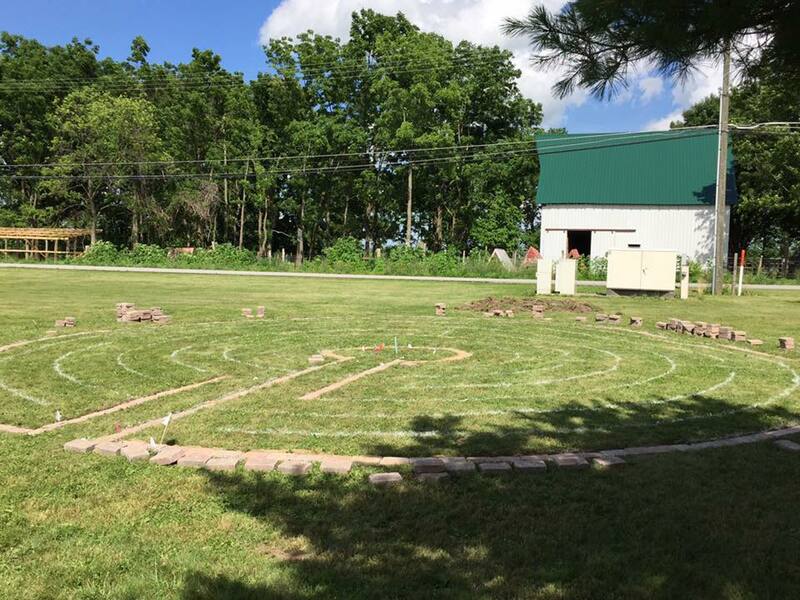 Bruce W. Gray and his Pathways to Vitality program, the people of St. Peter's set out to install a labyrinth on the grounds of the church. The labyrinth is designed to be a community space and is open to use from dusk until dawn each day of the year. In 2016, members of the Lebanon High School football team spent a day digging out the trenches of the 40 foot diameter labyrinth and laid one course of stone filling and leveling each stone by hand with sand. Over the next two days, members of St. Peter's finished the remaining circuits of the labyrinth and it was officially blessed during the Rogation Service in 2017. The labyrinth is of the Chartres design and is found on the Worldwide Labyrinth Locator website. It was designed by John Ridder, owner of Paxworks, and member of Church of the Nativity, Indianapolis. St. Peter's participates in World Labyrinth Day and other worldwide labyrinth walks. A method for walking a labyrinth is suggested here. As the master plans for the property evolve, the plan is to install a paver apron at the entrance to the labyrinth, install shrubbery and other landscaping around the perimeter and potentially a water feature. It will also tie into the walking paths planned for the entire property. Currently the labyrinth is accessible by the main entrance off of East Washington Street and parking in the small area by the gardens on the east side of the building. It is our hope to add a connector road off of John Bart Road with more parking. Please contact the church on our Contact Page with any questions you may have.